PennsylvAsia: ウェストバージニア - Wild and Wonderful. I don't check the Charleston Daily Mail often enough, it seems, because I missed this article from the beginning of the month. It's about a West Virginian web developer's "fascination with Japan" and his then-upcoming trip for personal and professional reasons. I was struck by the postcard Jamie Summers-Brown made for the trip. Giving gifts is traditional in Japan, and the exchange of business cards is a serious matter. "I wanted to give something about West Virginia," he said. "So I designed a postcard in Japanese." The front features a colorful picture of the gristmill at Babcock State Park and an outline of the state. 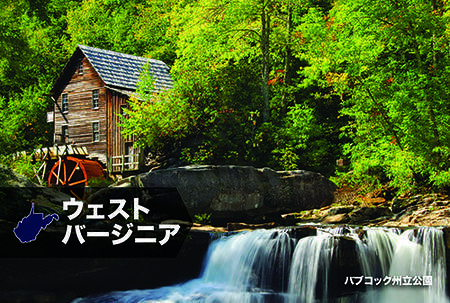 Next to the outline, in Japanese, is "West Virginia." At the bottom right there's a line in Japanese that identifies the photo. Summers-Brown also says "There are 21 Japanese companies operating in West Virginia and thousands of Japanese nationals working here."